> A one-way flight to your goal destination. > A few flights with a few weeks of adventures in between while still taking you to your destination and not costing a dime extra. Which journey would you opt for? There’s a bit of different way to travel for those who are a bit more spontaneous, adventurous and flexible. The basic concept is using what I call “one way to everywhere.” It’s not necessarily a novel idea, but it’s not widely used by many either. The concept can take any ordinary vacation and make it an extreme adventure for spontaneous souls who want to get more than just a one punch destination. 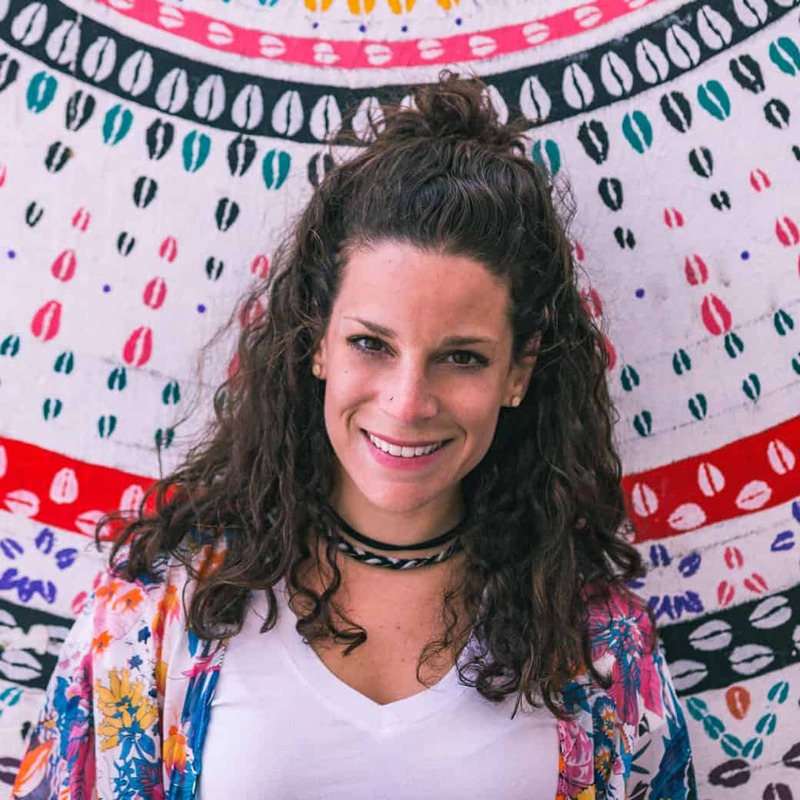 This way of booking cheap flights is for thrill seekers, road warriors, people who want to get more for less, and for those ready for epic journeys that span multiple destinations. Using Skyscanner, I make awesome itineraries for cheaper or the same price of a direct ticket! I like to work it in certain ways that I’ll share here with you along with my tips and advice. As I (begin) writing this post on a leg from Phuket, Thailand to Cologne, Germany, I can’t help but think we’ve been traveling in one mindset when we really have way more options. Everyone is under the impression that one-way flights are expensive and round trips are the way to go. They’re not necessarily wrong, but the problem is we need to answer what type of traveler you are and where you want to go first before we can say what type of flight is best for you. Are you a family looking to travel from A to B and directly back to A again? A round trip will likely be in your best interest and it’s probably going to be a hell of a lot cheaper too. Book that round trip, baby! But what if that’s not your route? What if you’re looking at going on an intrepid adventure spanning multiple countries, continents, languages, and currencies, and cuisines? You want to eat schnitzel, then a kebab, a pad thai, and a heaping bowl of kimchi after that. Maybe you want to go from Dong to Kip, to Shekels to Euros to Canadian dollars. STEP AWAY From the Round Trip Button Immediately. Let’s wash away those round-trip ticket myths and instead…. The concept is all thanks to Skyscanner. This is a flight search engine that I’ve been using for nearly six years. I kind of accidentally stumbled upon this idea years ago, but it’s known amongst intrepid travelers, especially nowadays! But anyone can use and benefit from this concept. You leave your faith within Skyscanner’s flight searching unicorns that work their magic behind your screen and they will pop up with a list of almost literally every country on earth that flies from that destination. Living in Thailand required me to leave the country every few months to renew my visa. Sometimes I’d just take a bus to the nearest country, wander about, then go back to Thailand. Sometimes I’d go a bit further and take myself on a trip that required a flight, and that’s where Skyscanner came in. I’d just click “everywhere” and it would show me the cheapest country to hop over to. I knew I would end going back to Thailand, but why backtrack to the same airport? Maybe I’d be closer to another airport? Or maybe I’d just travel back by land? I don’t like being tied down by too many future plans, so I sometimes wouldn’t book anything until a few days out or even the day of! Any experienced traveler will tell you that no matter where you’re going. Flexibility is KEY. 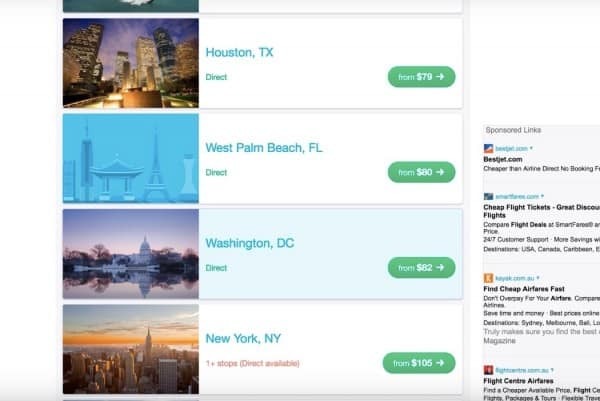 Not only does the “everywhere” feature get you a cheap destination, the month view option will get you the cheapest date to fly there. You can conveniently look at the month view and see the price each day of the month. Choose the cheapest or the most convenient, your choice. It goes beyond being flexible with timing, though, you have to be flexible with where you go as well. 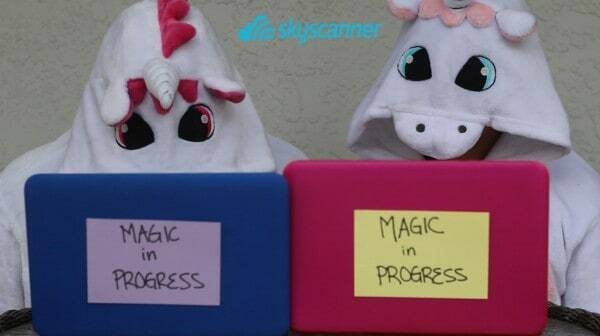 There’s no telling where those Skyscanner unicorns will tell you to go! Maybe you’ll end up in Egypt? Maybe Estonia? Perhaps Las Vegas? You don’t really know what will pop up as the first few cheap destinations from where you’re flying from! 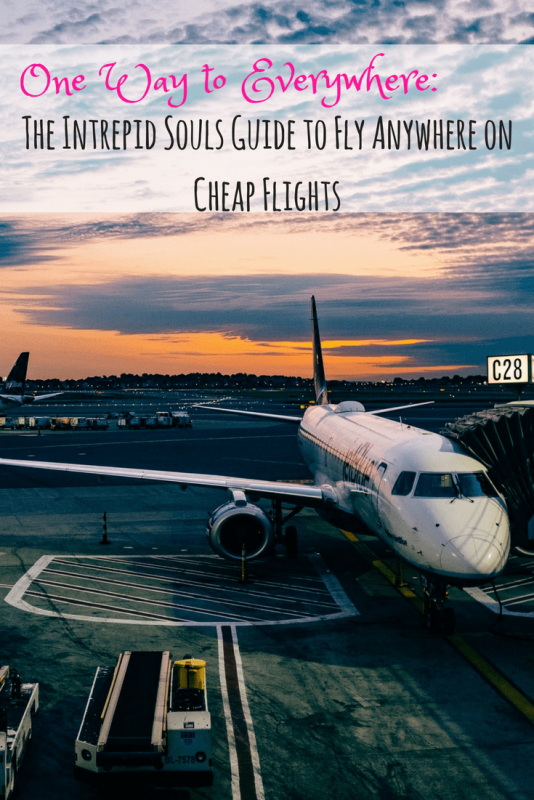 Here’s the Guide to Cheap Flights by Going One Way to Everywhere! Let’s use my most recent flights purchased as an example. My upcoming adventure with Skyscanner goes from the USA, to Europe to Asia! After meeting a rep in Manila last year, she loved my Skyscanner itinerary that I randomly brought with me. So we decided to collaborate on a trip this year! While you don’t really have to set a goal destination, I’m willing to bet there’s going to be one. I usually need to get SOMEWHERE but I don’t care HOW I actually get there. Let’s check out the itinerary Garrett and I are doing in just a few days time while I explain the process. Choose the month option so you can see the cheapest days to fly. You can even select “cheapest month” for even cheaper options if you’re mega flexible! The next step is to choose the best and cheapest date for you. REPEAT! You can repeat these steps as many times as you like to create your itinerary. So for this example, I now open a new tab, put New York as my origin city, and select “everywhere” and the month option again. I continued these steps until I found five flights that eventually plopped me down in South Korea for CHEAPER than it would have been for a one-way direct flight. 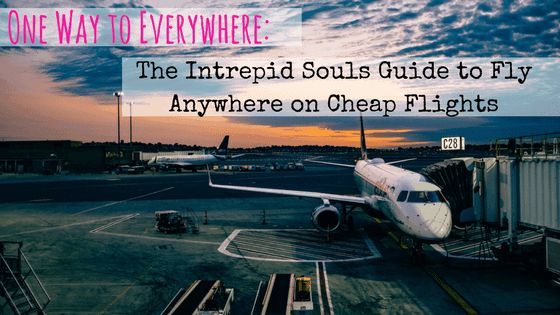 It’s actually easy to find cheap flights to anywhere when you’re flexible, willing to be a bit spontaneous, and make shorter jaunts towards your end destination. More of a visual learner? Here’s a quick video by The Travel Human to explain! The other way to make sure this method of flying is really working for you is making sure you’re heading in the direction you want. For my itinerary above, our goal was to make it into Asia. More specifically, Jeju. We didn’t really mind what countries were in between, but we made it a point select the flight with the cheapest price and the most “progress” towards our end goal – Jeju. RELATED: Flight hacks that don’t involve mastering airline miles! Huh? Didn’t I just talk about “one way to everywhere” and NO round trips for the past ten minutes?! Yes, but those one ways can actually become a round trip. Just not the traditional round trip we’re used to taking. Just book your one ways as I’ve explained with your starting point being your end point. So IF my goal was to go back to Tampa (my starting point), I could, for example, continue my trip from Jeju, to San Fransico to Tampa. A round trip without booking a round trip. The more “uncomfortable” your flight is, the cheaper it gets. I recently flew a 12 hour flight with no flight entertainment (first world probs, I know, but still) and I had to bring my food since every meal was extra. It saved me some cash. I got some work done, I read, I took a few naps, and I met a nice German college student who sat next to me and gave me tips for future travels to Germany. So really… did I suffer that much? Nah, and I saved cash! Yeah, I’d say I won that one. You aren’t spending money on accommodation for the night. You aren’t wasting a day on a plane. You can wake up from your flight and start your day. I don’t mind red-eye flights and I always opt for them, especially if they are the cheaper option. Order! I Must Have Order! How disastrous would it be if you got some dates mixed up and ended up booking flights that were a few days off and you happen to be in the wrong country….!??! Ahhh! Doing this one way to everywhere itinerary builder can be a bit tricky. Keep things in order when you come down to finally ordering your flights. Careful! 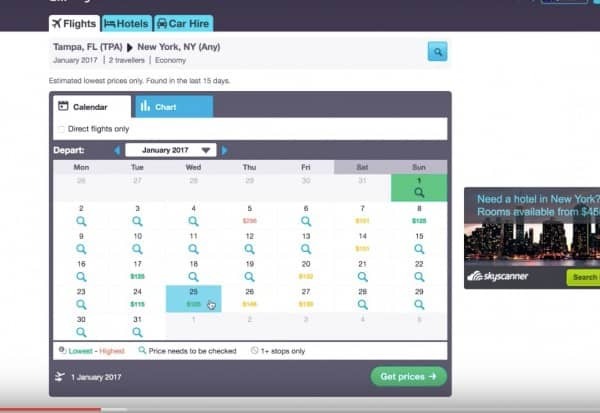 I open multiple Skyscanner tabs and search as explained above keeping all the tabs open of my itinerary so I can reference the date of the last flight on the previous tab. If I don’t like a result, I immediately close out that tab. I constantly check that my itinerary makes sense and I have the correct tabs open. I write things down (prices, dates, city names), I open new windows for research to avoid messing up my Skyscanner window and those tabs, and I just quadruple check EVERYTHING before booking. Keep it clean, peeps! I try to avoid countries that require me to get a visa while doing these trips if I don’t plan on staying in that country for a while. For example, Want to go to India? Ehhh wrong. I mean, you could. But do you really want to go to India for three days when you have to pay $60 for a visa and wait a few weeks for that approval? Probably not. If you plan and have enough time, then go for it! Sometimes roundtrips and long-haul flights might have you going through a country on a long layover. Be careful where those are! If you have to collect your baggage and go through immigration and security, you may be expected to have a visa. This is NOT the kind of surprise you want! And what about vaccines? I had never heard of this one, I hope it’s an old practice, but I once had an awful pre-flight experience and I needed a vaccine before boarding! Rediculous! We’re going to China, but are staying less than 72 hours in the country, which means we qualify for the 72-hour visa-free entry. If we were to stay one day over, we would be in big trouble! Double check to see if the country you want to go to offers something like this to scoot around the visa requirement. Check to see if your passport is valid for the country you’re flying to – Do you have enough pages? Is your passport expiring within the next year or six months? Some countries won’t allow you to fly if so! Always do your homework before booking. Not Sure Where to Go? Let Skyscanner Choose! The best thing about this feature is you don’t really know what the cheapest place is going to be so this is already an adventure before your adventure! 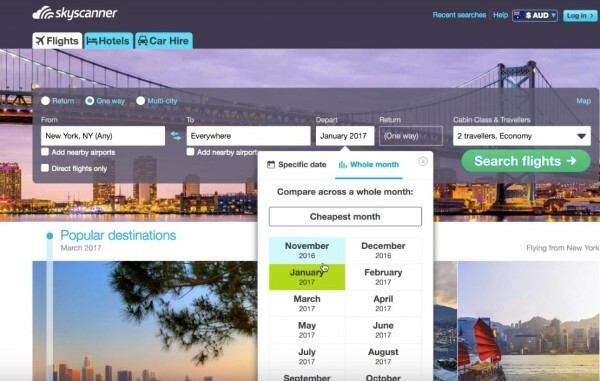 Figuring out what country you’ll go to next is all up to Skyscanner and their little magical unicorns working behind your screen to flick through their huge list of awesome places to present to you. Who Should Use This Idea? A perfect way for gap year students to make their way back home or to fill up their entire year going around the world! Nomads looking for a way to spice up their travel plans while saving in flight costs. People with a sense of adventure and a few weeks or more to roam the world. This is by far my favorite flight hack for saving some cash while still having an epic time. 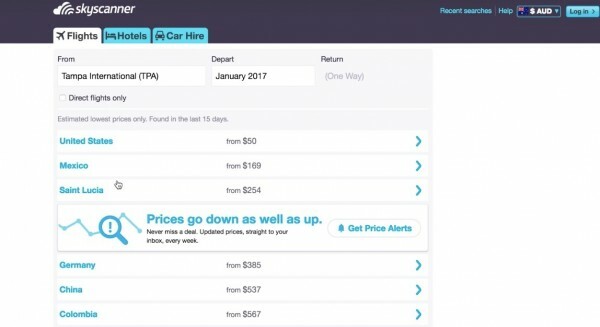 Check out Skyscanner.com or download Skyscanner as an app on your phone to see what one way to everywhere you can come up with! So what do you think? Would you use Skyscanner to fly anywhere like this? Have you done something like this before? Share your itinerary with us! Whhaaattt that’s amazing! Yes, you should def try it. It doesn’t ALWAYS work out to be cheaper and you do have to be super flexible but it’s always something I check every time. Cool idea..just think the money you save on the flight will probably be spend on accommodation and food on your layovers. So with all these detours it will actually work out more expensive in the end if you add these expenses hey. Yes! It’s so much fun. It’s such a great tool for searching. Spent less on all flights together than one round trip to London lol. Crazy. But you’re right, the key is FLEXIBILITY! Check out #40daysofcray to see how my trip turned out? Glad I finally got around to watching the FB live video and finding out about this. I am going to read a little more on the blog. I am a planner…an over planner. I have been planning 6 weeks in South America capping off with a hike up the Inca Trail to Machu Picchu. And all this time I thought, book lodging then flights….NOOOO! Book flights through skyscanner everywhere! I just found a flight to Quito, Ecuador for $189 from Austin. That is half of what I would have been spending to get to Colombia which was my original first planned leg. Now I need to cancel all my Airbnb’s and rethink everything. Thanks for the tips, going to be reading to see if I can find some more tips on spontaneous travel and how far in advance you book lodging and other things. Awesome, Khara! 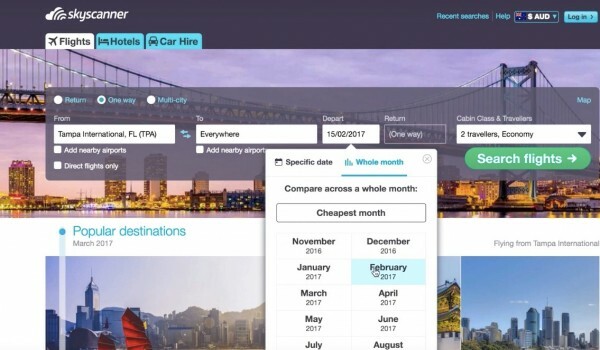 So glad you found out about this great tool now 🙂 you’ll get some great ideas and itineraries using skyscanner for your trips! It’s so much fun to play with. I had never heard of this and now I am reaaaally excited. I can’t wait to try it out. This is so cool! Thanks for sharing! Yay awesome! How exciting! It’s such a fun way to book. Have fun. i LOVE Skyscanner and the everywhere option is basically my favourite past time. I seriously sit at home and every couple of days take a peek and see where I can go. A lot of my travels depend on seat sales so I adore this feature! These tips are awesome, I love doing trips where you fly into one city and out from another but it hadn’t really occurred to me to do a whole string of them. I will now though! Skyscanner is brilliant, absolutely love the Everywhere feature! Oh no 🙁 that’s a shame, Aneesha. Hopefully you can make it work around Asia at least and perhaps plan ahead to make it work for some other countries? I hope! Sounds amazing! Hopefully I get to read about what your itinerary came out to be!! Flexibility is definitely key here. But that’s great, because I love using this feature from Skyscanner. And it’s fab that you can find stuff to suit your budget. I love it. Thank you for sharing. Thanks Cory! Flexibility is SO key when we talk about saving money on travel! What a fantastic way of doing things! I often travel on the cheapest possible flights, going all around the place to get to my end destination but I’d not really thought about breaking them down further. Love your work! 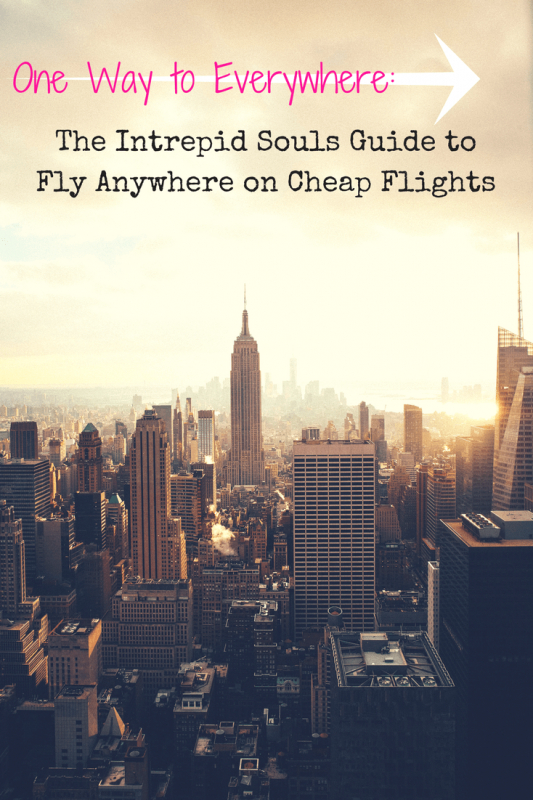 Great post, I really need to get more flexible with flights as it can save so much money! That’s definitely an interesting way to travel hack. That’s for sure. If I wasn’t a 9 – 5’er and had the luxury to travel for weeks/months on end, then I totally would use this technique all the time. 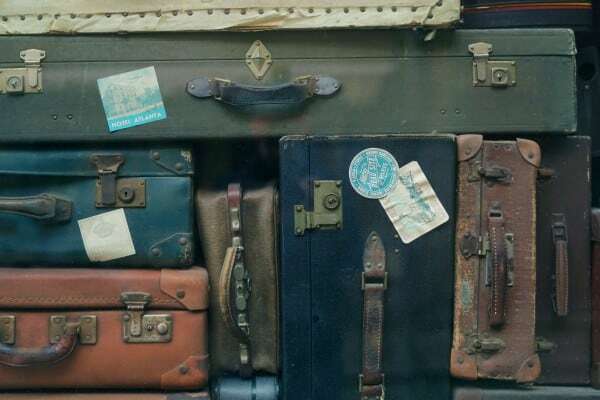 Perhaps I can try this for a 2 – 3 week trip where I may be able to visit two countries in one trip as it is pretty easy to visit multiple countries on one trip to either Central America and Europe.